Day cruises to Lady Musgrave Island departing Bundaberg or Town of 1770 (Agnes Water). All inclusive day trips to the Lady Musgrave to snorkel the lagoon and explore the island. Includes lunch, morning tea, snorkelling equipment (and instruction), glass bottom boat, guided island tour, all fees and taxes. We recommend you bring your swimmers, towel, hat, rashie & reef shoes and underwater camera. Introductory Diving is available is you’ve never dived before, are not certified, or just need a refresher. We have qualified experienced instructors so you can try diving for the first time. Certified Diving is available and qualified divers have access to many dive sites on the outside of Lady Musgrave Lagoon. There are many types of dives ranging from beautiful coral gardens to spectacular wall dives. The sites chosen depend on weather conditions and diver experience. Whether you are an experienced diver or a complete novice, Lady Musgrave Island is the perfect outer reef dive destination. 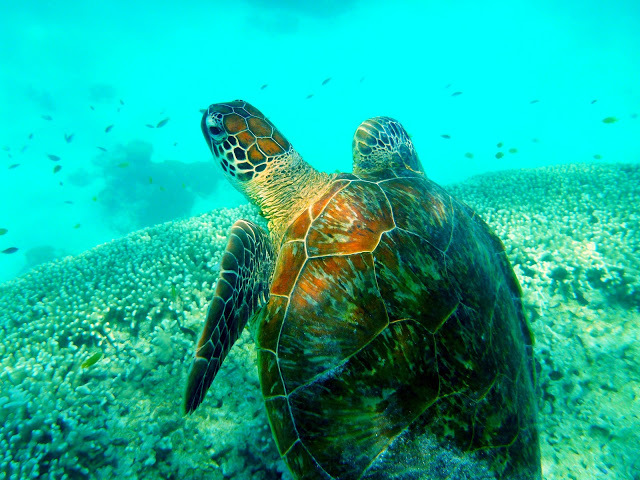 Qualified divers have access to many dive sites outside of Lady Musgrave Lagoon. All equipment is included. The diving price is additional to the day cruise price. Available with or without equipment. Lagoon and outer wall diving available (subject to numbers). The diving price is additional to the day cruise price. Camping with a permit is allowed on Lady Musgrave Island. Limited camping permits available to protect this pristine environment. Lady Musgrave Island is your unique experience of camping on a true coral cay. There are no buildings, shops or roads on the island so you will need to bring your water, food, camping and snorkelling equipment. A full list will be provided when you book. The price includes transfers of you and your gear to and from the island, morning tea on the trip over there, lunch on your return trip to Bundaberg. Check-in of your gear will be advised at time of booking and will be early the same day, or the afternoon prior. Prices subject to change at any time without notice. Prices may not be valid for peak times.